On July 14, the infield of Bristol Motor Speedway will once again become the battleground for some of the most destructive machines on the planet as eight of the best monster trucks in the world compete for glory at Beef 'O' Brady’s Monster Truck Madness. 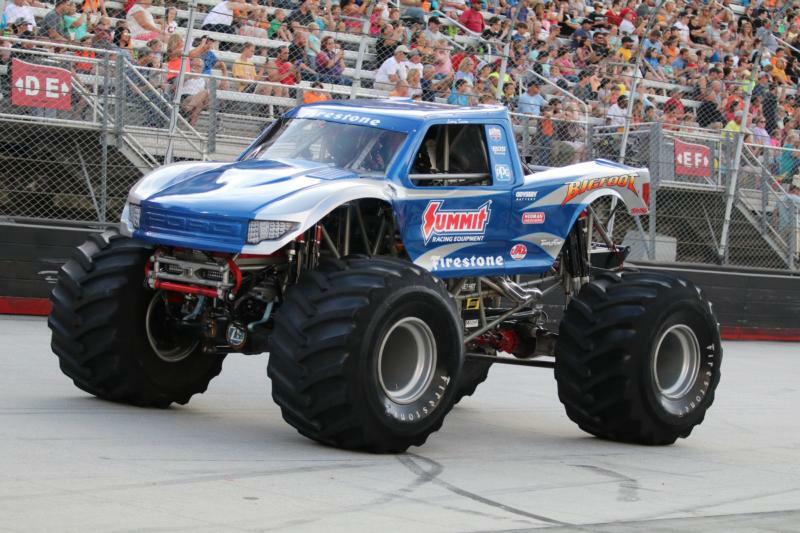 Monster trucks that will perform at The Last Great Colosseum include the original monster truck Bigfoot, fan favorite Quad Chaos, Dirt Crew, Hooked, Stone Crusher and Bristol newcomers Jester, King Krunch and Nitro Hornet. The eight trucks will compete in two disciplines: racing and freestyle, always a fan-favorite. Fans should arrive early when the gates open at 5 p.m. for the Beef ‘O’Brady’s Pit Party to grab a photo beside the massive Bigfoot and meet all eight monster truck drivers who power these 2,000-horsepower brutes, purchase $10 tickets for a ride in the Sasquatch bus and enjoy all the pre-race festivities. Beef ‘O’ Brady’s Family Sports Pub will provide balloons and coupons for a free kid’s meal, redeemable the following Tuesday at locations in Johnson City, Kingsport and Elizabethton, at the entrance to the pit party. There will also be a post event pit party following the conclusion of the show. The show will begin at 7:30 p.m. In addition to the monster trucks, the event will feature a drifting exhibition by East Tennessee Drift, Team FMX motocross performing their high flying acrobatic show and the fan-favorite, car-eating monster, Megasaurus. Prior to the event, Bigfoot will be on display Friday, July 13, 5:30-7 p.m. at the Beef ‘O’ Brady’s located at 173 Hudson Drive, Elizabethton, Tenn. while Jester will be visiting the Kingsport location at 300 Clinchfield St. Kids can eat free during those hours at both locations, as well as at the Johnson City location at 2913 Boones Creek Rd. General admission tickets for this night of family fun are $20 ($25 day of) with advance purchase. Tickets for kids 12 and under are only $5. For more information and to purchase tickets, call 423-BRISTOL or visit www.BristolMotorSpeedway.com.